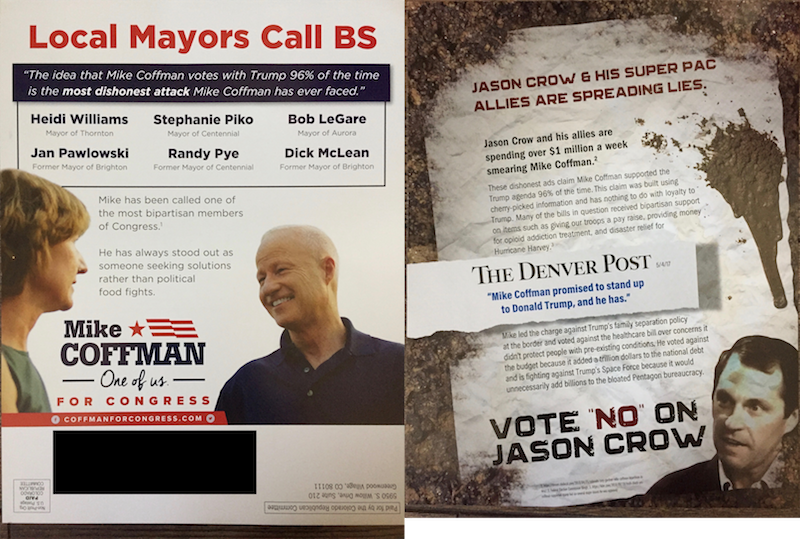 This mailer from the Colorado Republican Committee highlights endorsements from three current and three former mayors for U.S. Rep. Mike Coffman in the 6th Congressional District. It also attacks Democratic opponent Jason Crow "and his super PAC allies" for spreadimg lies. It also says Coffman has stood up to President Donald Trump. Reality checks have found both sides of this campaign lacking when it comes to the truth. Find out more here from the Colorado Sun and CBS4. The Colordado Republican Committee is the federal fundraising arm of the Colorado Republican Party. This federal political party committee may take up to $10,000 in individual donations. About $225,414 of those donations came from a federal joint fundraising committee, the Stapleton Victory Fund, which is supporting Republican gubernatorial candidate Walker Stapleton.